You are here: Home / Chandler AZ Real Estate / Sun Lakes Home for Sale – 24211 S. Briar Wing Dr.
Sun Lakes Home for Sale – 24211 S. Briar Wing Dr. In a great location, this 3 bedroom, 2 bath home at 24211 S Briar Wing Dr. offers a split bedroom floor plan and your own private pool! As you enter the dining room and living room, huge windows overlooking the expansive, covered outdoor living area and private pool welcome you. With decorative paint, neutral tile and carpet throughout, this home is warm and inviting. fridge, and comfortable breakfast bar that opens to the family room. 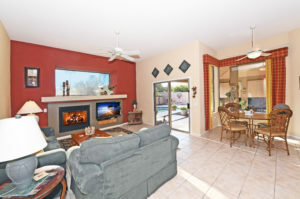 Here, you’ll find a gas fireplace, informal dining area and patio access. And when it’s time to retire, the spacious master suite includes plantation shutters, dual vanities, and a separate water closet. What about storage? If you need a lot of space for your clothes, shoes and accessories, there is a walk-in closet and a second closet! And your guests will love having their own, private bedrooms with a nearby bath that is on the opposite side of the home. And one of these bedrooms can easily be converted into to an office. 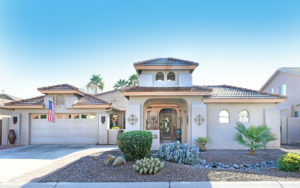 This Sun Lakes homes offers a large lot with a golf cart garage. And there is also storage space and a utility sink in the garage! The water heater is 3 years old, and the exterior was painted 6 years ago. The AC’s interior parts have all been replaced, and the soft water is new in 2014. This home is move-in ready and in the Oakwood gated resort community where you have access to numerous amenities including: golf, tennis, pickle ball, heated pool and spa, workout facility, clubhouse/rec room, biking/walking paths, an on-site guard, and a concierge. Hurry! This spacious, Sun Lakes home for sale won’t last long! Get all of the details here, or call me directly at 480-440-0849.